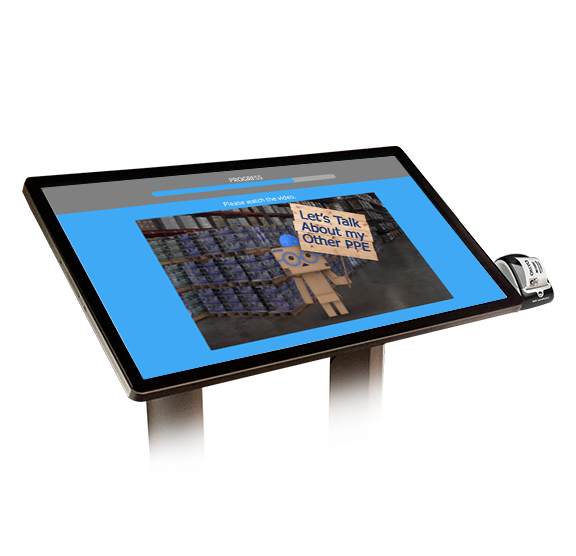 Welcome your visitors and elevate your brand image with an inviting, easy to use, Digital Reception. 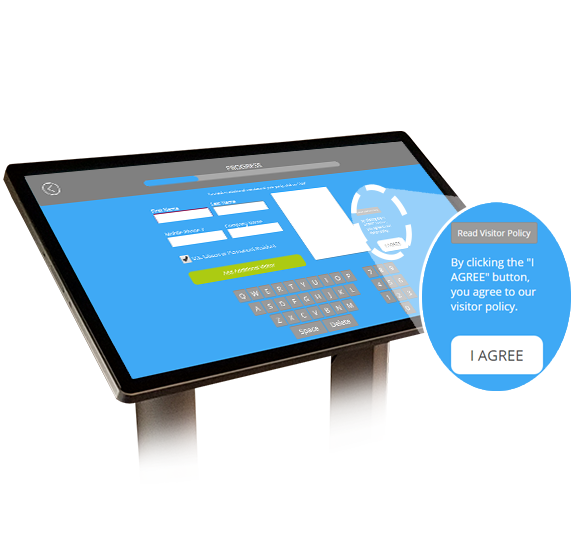 The kiosk walks your guest through your check-in procedure, explains policies and procedures, defines safety expectations, collects required information and consent then prints a name badge. Keeping visitors engaged with video can decrease perceived wait time by 35%. 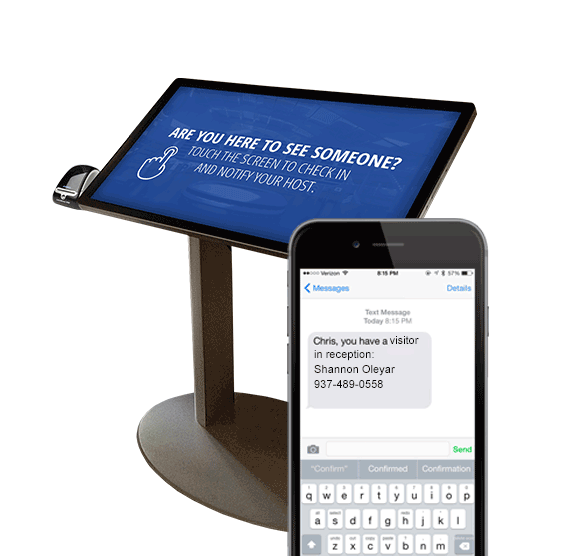 You’ll be alerted via text message and/or email that a visitor is waiting in the lobby. The notification will display the visitors’ full name, company and cell number. If you’re busy or unavailable, it’s easy to send a text notifying them. Customize the video for different types of visitors (applicant, contractor, vendor, client, regulatory agency, etc). Chose the message unscheduled visitors will receive when attempting to check in. 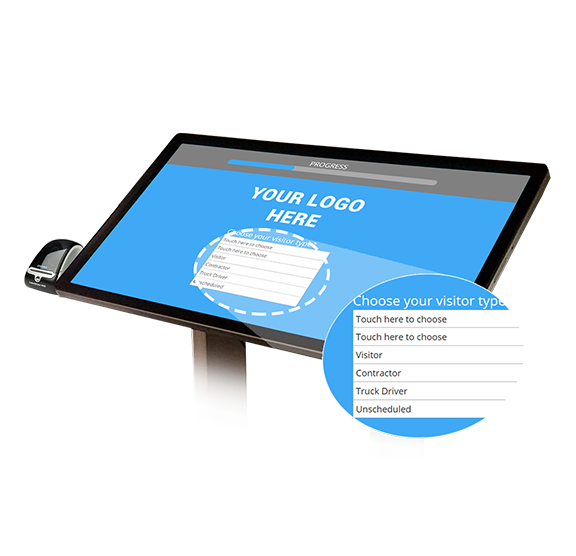 The Digital Reception interface, videos and name badge will be personalized with your logo, branding, colors, fonts and comply with existing visitor requirements. All the information is collected and cloud stored for easy retrieval/exportation. In the event of an emergency, you can easily access who is in your facility and text them with instructions. If a visitor fails to check-out after a designated period of time, they will receive an automated text asking if they’re still on site and update itself accordingly. Tired of repeating yourself? 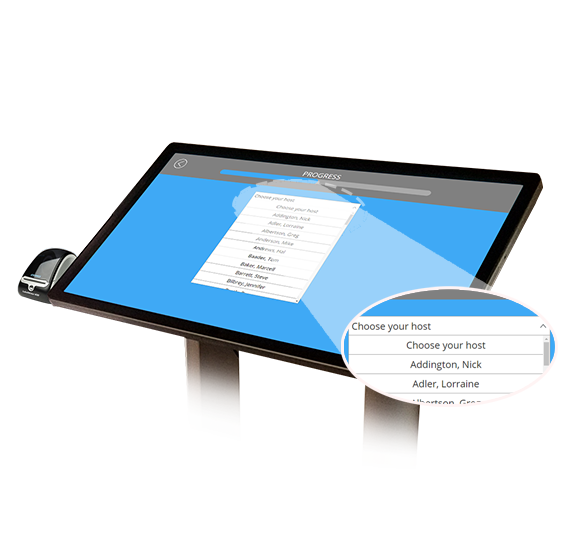 Allow the kiosk video to cover information relevant to the nature of the guests’ visit. Applicants, contractors, vendors, clients, regulatory agencies and corporate employees may need different information. The Digital Reception is designed to fit your needs. Visitors enter their first and last name, company name, cell phone. If multiple people are checking in together, select the “Add Additional Visitor”. Once all visitors are signed in, they will select the “View Visitor Policy” button (your written policy displayed in a pop-up window) and/or “I Agree”. Visitors will have two options: “Choose Your Host” or “I Do Not Have A Scheduled Appointment”. When “Choose Your Host” is selected, a drop down box appears and lists the available personnel or departments. A text and/or email is then sent to the employee notifying them of their visitor. If a visitor selects the “I Do Not Have A Scheduled Appointment”, your personalized message will display or the designated employee will be notified. Customized, Fully Animated Video plays with or without sound. After the video is finished, a name badge (or badges if multiple people were in the party) will print displaying the required information. Your visitor will receive a text message stating that the host has been notified and will be with them soon.